Yes! You can improve your climbing results by learning to understand your unique physiology and using this knowledge to plan your training and performance strategy. 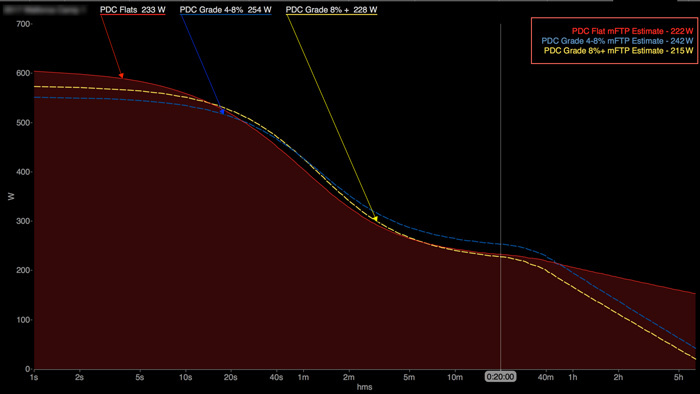 Take a look at the chart below (Power Duration Model by Grade, available in the WKO4 Chart Library), for which I created three unique gradient range “bins”: PDC Flats (all recorded points riding on grades less than 2 percent), PDC Grade 4-8 percent (all recorded points of riding on grades of 4-8 percent), and PDC Grade 8+ percent (all recorded points of riding on grades above 8 percent). This article was written by Tim Cusick. Read the original blog post here.